Eastnor Castle, is located just outside the pretty town of Ledbury, Herefordshire. It is surrounded by beautiful deer park, arboretum and lake, with the Malvern Hills providing a dramatic backdrop. The home to the Hervey-Bathurst family, Eastnor Castle can be hired exclusively for your wedding. Civil weddings can be held in the Gothic Drawing Room or the village church of St. John the Baptist can be used for ceremonies of up to 150 guests. 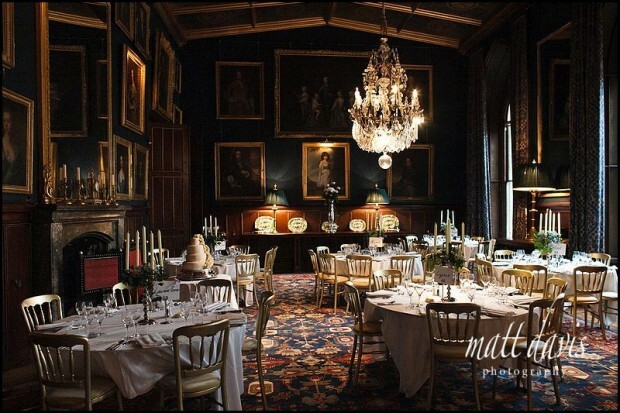 For the reception the State Dining Room seats up to 80 guests or the Great Hall can be used, seating up to 150 guests. For much larger weddings, the Castle can be used as a drinks reception, with a marquee for dinner on the lower terrace next to the lake. There are also 12 beautiful guest bedrooms in the castle, which are available for the bride, groom and guests. Eastnor Castle is only ten minutes from the motorway and two and a half hours by car from central London. Similar wedding venues nearby: Sudeley Castle, Berkeley Castle, Clearwell Castle. There are many Castle wedding venues in the Cotswolds, but if you step just outside this catchment into Herefordshire you’ll stumble upon this amazing Castle. What stands it appart from it’s peers such as Berekeley & Sudeley Castle? Well, quite simply it’s interior. This is a big place! Apparently (so my wife tells me) this isn’t a castle built for fortification, but more a stately home, which shows as you walk around. There is an amazing collection of armor on show and the walls are covered with prize animal heads from trophy hunting in years gone by. 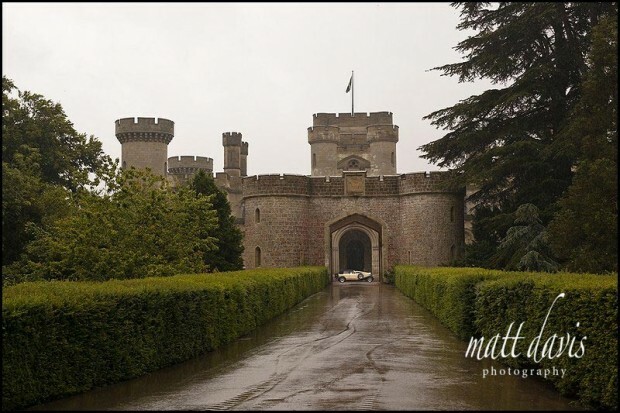 The location of Eastnor Castle also makes it a spectacular wedding venue. It’s set relaitvely close to good motorway access points, but once you’re 10 mins off these, you enter the charming countryside surrounding Ledbury, a traditional market town in Hereforedshire. The castle itself is set in many acres of land, with a picturesque private road leading up to it. The outlook from the castle is across it’s own private lake, making this a stunning wedding venue on a summers day, where you can soak up the view on the terraces. Nearby you also have the church of St John the Baptist in Eastnor, which can be used for your wedding ceremony. Alternatively the castle certainly has sufficient space to cater for your wedding indoors, should you wish for a civil ceremony. If you’re looking for an atmospheric wedding venue that’s slightly ostentatious yet not apologetic for this fact, then look no further – Eastnor Castle is the one for you! 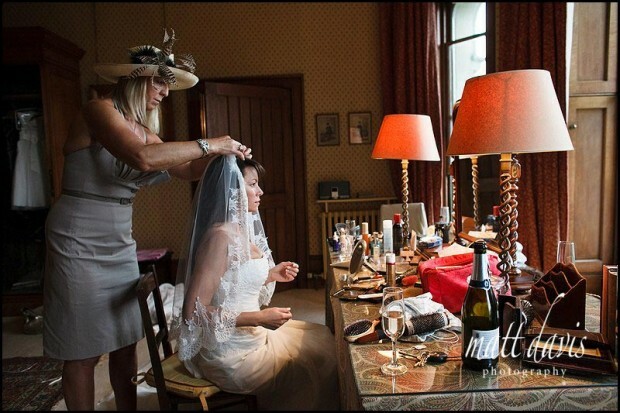 If this takes your fancy, why not check out these Eastnor Castle wedding photos on my blog. I’m also a recommended photographer by Eastnor Castle and have supplied many photos which they use in their wedding brochure. 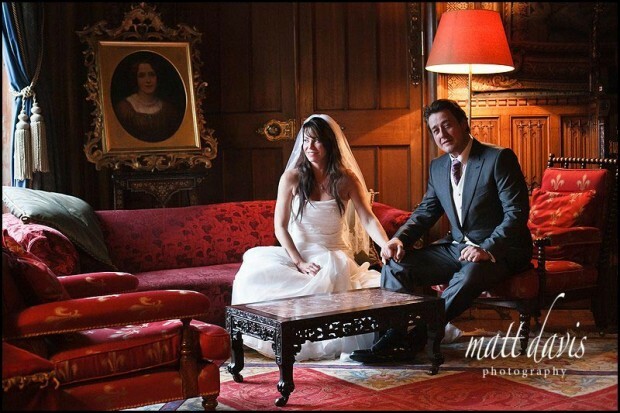 If you are considering a wedding at Eastnor Castle then please contact me for a chat about your wedding photography.